Thoughts from a Traveling Tech: Balloon down! The same trip as the previous bottle post I also had another exciting event. 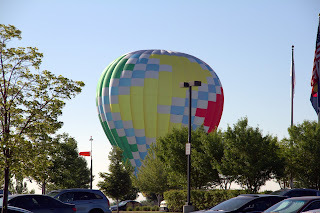 As I was driving from the hotel to the workplace I noticed 3 balloons off in the distance that seemed to be rather low. The closer I drove to the client site, the more I could see that the balloons were also near the client site. They were also coming down at the same time. By the time I had come to the client's location and turned off the highway to their parking lot this light colored balloon was coming down in the grass less than 100 yards from me. Since I was driving at the time I didn't want to risk taking a picture and handling the traffic so this picture was taken after the car was safely parked in the parking lot and I could get the camera out without harm to myself or others. As you can see the balloon was rather close to me where I parked, but I had just driven in near where is it sitting in this picture. But this is only 2 of the three balloons. 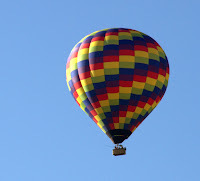 I had lost track of the third balloon because it had come down somewhere on the other side of the building. A quick check of the time told me that I just didn't have time to go look for it since I actually was there to work not ogle balloons. After checking in at the front desk and getting my badge I headed back to the back of the building to check in with customer. As I am turning the corner into his row what should I see but the third balloon is setting down in the field right outside! I quickly grabbed the customer to show him and he suggested that we should go outside instead of trying take pictures through the blinds. 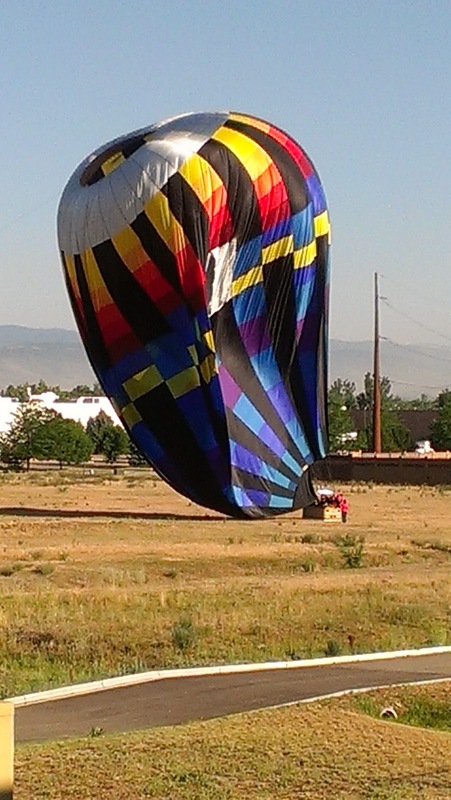 We headed out the side door and right there in the field in front of us they were deflating the hot air balloon. I was quickly informed that they are probably going to be very upset with themselves later as that field is covered in yucca and cactus. This was a rather uplifting event for me. Anything cool like this happen to you?